I took this photo at the Mauna Lani Resort on the Kohala Coast of the Big Island. While staying here, I stopped by the shark pool at least once a day. It was mesmerizing watching them swim around. It’s kind of freaky to see them so close without a glass panel between you and them. Nice one! I love your pictures, Sheila. The thing about living in Hawaii is you should never leave home without a camera. Sheila, ‘Mr. Shark’ is probably swimming back and forth and back and forth on that pool because he’s really rather be out in the open ocean or cruising along a pretty reef. @ Kailani – It is kind of freaky, but what’s freakier is to be snorkeling and see one out in the open. 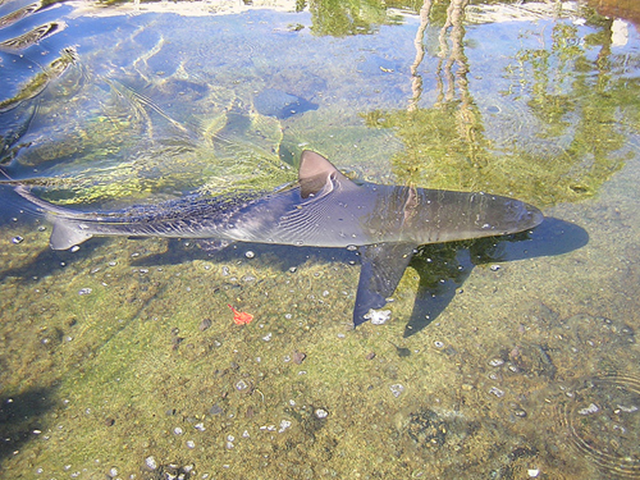 I saw a 5′ reef shark in Hulopoe Bay at Lanai. He just did his thing and I did mine and we were fine. @ Charley – Mahalo for stopping by and commenting for the first time! You are so right, Hawaii is filled with so many picturesque places.! Yes, Bobbie, you are right, the pool for the baby sharks (outside the hotel) and the sting rays (inside the hotel) at mauna lani is not big but many people would otherwise never see a shark or sting ray in real. What a cool photo! That is pretty close up. I can’t imagine snorkeling with sharks. I would totally freak out!